The preparation of an estate plan focuses largely on ensuring that beneficiaries receive property or assets after the person creating the plan passes away. The kind of property people typically consider when outlining their wills or trusts is physical property or money in accounts or that will be paid out in insurance policies. One often overlooked aspect of estate planning is the handling of a person’s digital assets. The term “digital asset” in this context refers to a person’s access to online social accounts that in our society may hold a wealth of information about a person’s life. When a person dies, these accounts may become inaccessible to a loved one who may not have a password, or who is otherwise barred from accessing the account under the terms of service agreement governing the use of the account. Some companies have features that can be enabled to assist with the management of a person’s account after death. Users are allowed to name a person who will be given access after the user’s death to manage the person’s account. However, this is not the only way in which to ensure a trusted person can access these accounts when the time comes. Florida recently joined several other states by enacting the Florida Fiduciary Access to Digital Assets Act. 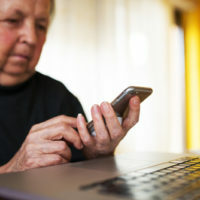 This law makes it easier for people to create a digital estate plan, and for personal representatives to gain access to a person’s accounts. Creating the digital estate plan can also be as simple as cataloging the online sites that a person is involved in, including social media, blogs, financial accounts on platforms such as Paypal or Dwolla, and writing down the important access information for the sites. This is information that a person would need to access these sites later on. This information should then be kept in a safe and secure place to avoid any improper access by unauthorized individuals. While it is may be easier to keep this information digitally, it may be safer to keep it in a hard copy document, unless the online storage used is secured. Access to digital assets can be limited to whatever content the person creating the estate plan is comfortable with others having access to. Therefore, if a person wants to allow a personal representative to have access to pictures and videos stored in an online account, but not the electronic communication associated with that account, the person can set these limitations in the estate plan. Alternatively, if a person does not want anyone accessing his digital assets, especially his social media, after his death, he may be able to set up an alert with the service provider to delete his account after a specific period of inactivity. This feature would be account specific, and may not be offered by all companies. Creating an estate plan for your digital assets should be part and parcel of your larger estate plan. You should carefully discuss this issue with an experienced estate planning attorney as you discuss your other estate planning needs. For a consultation, contact an experienced estate planning attorney in The Villages, Florida by calling the Millhorn Elder Law Planning Group.